While there are various scales which historical-based WWII-era games utilize, when it comes to 15mm (1:100) scale WWII wargames only one name comes to mind, Flames of War from BattleFront Miniatures. I played Flames of War briefly about 7 years ago. It was fairly new then, and not very many people had adopted it locally. So I was out of it, as fast as I was into it, which was quick. The main draw for me was how detailed and nice the miniatures were for being so small, and that's still the case today. The only difference is, the game has evolved, there are a lot more scenarios which the game can be played out within, and there are now hundreds of miniatures to choose from. 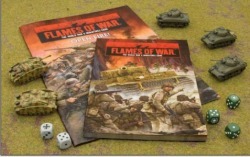 The most up to date starter box for Flames of War is called Flames of War: Open Fire, released in January of 2009. It includes a trimmed down 164-page rulebook, 3x M1A1 Sherman Tanks, 2x StuG Tank Destroyers, 16-page Quick Start guide/rules, 2x German dice and 3x American dice. This also the same vital content as the 2nd Edition Hardcover rulebook you can buy separately, but minus all of the modeling, historical background and optional rules and scenarios. If I had to compare the rules to anything else at a glance, I'd have to say that it resembles Warhammer 40k at the basic level. Very much like Warhammer 40k, a turn is played out via You go/I go turns, in a Move/Shoot/Assault format. That's where most of the comparison to 40k ends. Unlike 40k , you are allowed to pre-measure things. This has been a heated discussion online on various online forums, but the fact remains, it's only an issue if you come from the GamesWorkshop game system mentality. GamesWorkshop has brain-washed gamers into thinking that pre-measuring = bad. Even now Games Workshop allows pre-measuring in the newly released 8th Edition of Warhammer Fantasy. Therefore that mentality is beginning to change. Flames of War isn't terribly difficult to learn, simplicity is what makes it a great game. Everything to be rolled in the entire game can be done on a single D6 die. As you notice in the Open Fire starter, they give you a number of dice equal to the number of miniatures you're given. That's all you need, one die for each piece. The quick start guide from Open Fire details everything nicely. There's the Starting phase, Movement Phase, Shooting phase, and Assault phase. The Starting phase is meant to clean up a lot of the chaos from the previous turn, like rolling to... remount vehicles from being Bailed Out, rolling to Rally Pinned Down troops, rolling to free Bogged Down vehicles, etc. Aside from that you check Morale and Victory Conditions at the Start of every turn, and deploy any Ambushes and Airstrikes, and roll for any Reserves as well in this phase. More than anything, this is the maintenance phase. Like most other skirmish games, the movement is fairly common sense driven. The distance that the pieces can move, is based on the delivery system they employ (tracks, wheels, feet, etc), and/or the type of model. For instance all Infantry always move 6-inches on Roads, Cross-Country and through Rough terrain. Tanks are considered a Fully-Tracked vehicle, so their movement is 12-inches on Roads and Cross-Country, but only 8-inches through Rough terrain. Half-Tracked and Jeeps can move 16/12/4-inches, so they move faster on Roads, but really take a hit when it comes to Rough terrain. Average Wheeled vehicles move 16/8/4-inches. As you can see it's a very common sense, and realistic movement system. Measuring can also be done via inches or the metric system, but you need to determine which you'll use at the start of the game, and stick with it. “At the double” as the name implies allows for double the distance move, but has some restrictions. Think of “At the double” as running in most other games. Don't expect to shoot in the shooting phase if you move “at the double”, you can't pass within 8-inches of enemy pieces, and don't expect to Assault either. There are also some special rules that override normal movement rules, like Fast Tanks, Light Tanks, Slow Tanks, Unreliable, etc. Like most other popular skirmish games, you also need to keep within Command Distance the entire time, very much like Warhammer 40k's Coherency. Transports are also part of the game, only embarking and disembarking is a little different than what you may be used too. To get in, the transport has to move first, then passengers can Mount up. Next turn. Transports cannot move first, then let passengers Dismount. Passengers must Dismount before a transport uses its movement that turn, or just leave the passengers on-board and move with them inside. Essentially it takes a few turns to hop into a vehicle, move somewhere, and then get out, but when passengers do dismount they get their full movement, and can hit the ground running. Shooting is a little unique. There are three different Skill levels, Conscript, Trained, and Veteran. Throughout the game which one of these three Skill levels your troops are, and which level that the enemy troops are determines a lot. For instance, it doesn't matter if you troops are all Veteran level when shooting, it's what the enemy level is that counts. I guess they feel that Veterans would be better at avoiding incoming fire, and would be more evasive and take cover, more than a Conscript or Trained foe. Once you have a Valid Target, by checking the Range, being in Line Of Sight (LOS), and it being in your Field of Fire (your firing arc), then you can roll to shoot. This is the simplicity of it all. If the enemy is a Conscript you need a 2+, if the foe is Trained a 3+ is needed, and if the enemy is a Veteran a 4+ roll is needed on a single D6. Of course there are some simple modifiers, like if the target is over 16-inches add +1 to the roll. If they are concealed, or have Gone to Ground as well, more modifiers are added. The rule is, if the roll ends up being a number higher than what you can get on a single D6, it automatically fails. So anything 7+ is an epic automatic fail. There is a few other rules too for shooting, like Rate of Fire, and if you moved before attempting to shoot, your ROF is automatically reduced to 1, and if your target moved “At the Double”, you get twice as many dice to roll to hit them. The enemies you just successfully shot, can also end up getting a “Save” roll, depending on what type of piece they are. Infantry always save on a 3+, Gun teams however need to get a 5+ or die, since they're moving around more to man the guns during all the chaos, more than the average soldier. Unarmed vehicles get a 5+ save. Armored vehicle Saves are handled a little differently. The armor rating of which part of the tank hit helps to dictate what you are to add to the D6 roll. Rear or Side shots are more effective, since those have a lower armor rating. The formula is... Armor Rating+ D6, versus the Anti-Tank rating of the weapon used to determine the result. If the shot player exceeds the Anti-Tank rating their save is successful. If the roll equals the Anti-Tank rating, they didn't penetrate your armor, you still fail the save, and the attacker rolls a Firepower test to determine if you Bail Out, or if there is no effect at all. If you roll is less than the Anti-Tank rating, then you fail the save and the attacker makes a Firepower test, and now you end up either destroyed, or Bail Out. If Bailed Out you can attempt during the Starting Phase next turn to return to the vehicle via a Motivation Test. If destroyed, the passengers get a Passenger Save of 5+, and even if they pass they're considered Pinned Down. Additionally any platoon that was successfully hit 5 times during the same shooting phase is also considered Pinned Down. There's a variety of other little mechanics and rules for the Shooting phase, like Digging In, BulletProof Cover, Smoke Ammunition, Flame Throwers, Machine Guns, Infantry Weapons, etc, but I think I touched upon the basic mechanics enough to give you an idea of how it all ties together in play. The Assault phase is also a little different than what we're used to in most other games. To assault first off you have to be within 4-inches, which is what they call Striking Distance, and you don't need LOS to the the enemy. At few restrictions exist tho. Infantry cannot outright assault tank platoons, since it's pretty much a death-wish, but if they pass a Morale test they can. If you don't have a Platoon Command team you can't assault, and if you moved “At the Double” during the movement phase, you cannot assault. Pinned down platoon infantry can't assault, but the attached Tank teams can, and Cavalry can assault 8-inches, instead of the normal 4-inches since they move faster on horseback. Tanks can't assault tanks either. Here's where it's different, and refreshing. As a last ditch effort, the opposition get to conduct Defensive Fire on the Assaulting force. If the defender is able to get off 5 successful shots, then the attacker is considered Pinned Down. All of the normal shooting rules apply during Defensive Fire in the Assault Phase. If Defensive Fire succeeds the attacker then falls back, and the assault is over and a failure. However, a fully armored tank platoon doesn't fall back, which is the exception to the rule. If the assault ensues, then things get brutal fast. It's an ongoing round of assaults, until there's a clear winner. In an assault only armored vehicles get saves, and the save is versus the top armor value only, which is next to no armor. Passengers of vehicles are now outright killed, instead of Pinned Down. The Assaulting side wins the first assault round once either no teams are left from the defending side, or if the defenders side is completely Bogged Down and/or Bailed Out. If there's no clear winner, now the defenders have to take a Morale Test to see if they continue on as the attacker, during yet another Assault combat round. If they fail they must Break Off, if they pass they have the choice of CounterAttacking or Breaking Off. Defensive Fire also isn't given to the defender of a Counter Attack. The victor of this round can now Consolidate, or launch now a BreakThrough Assault. Deep stuff, Assaulting in Flames of War is quite different. Also if your army ever reaches Below Half Strength, meaning you have more lost pieces than what's on the table, then you take a Morale Test during the Starting phase, and if you fail the game is over. There's a bunch of other types of pieces too like Artillery (big guns, observer teams, rocket launchers, smoke bombardments, mortars, etc), Aircraft/Air Support, Anti-Aircraft Fire, and Reconnaissance Platoons which the rulebook covers in detail. Most of which I can't comment much on, since I haven't had the chance to play those yet. My battles have been limited to tanks and infantry battles. The next section of the rulebook details all of the Special Rules which apply to the US, Germany, Great Britain and the Soviets. Each side has almost a dozen special rules, and the Soviets more than any of the rest. For instance US forces have Stabilizers on their tanks, so they can move and shoot their full ROF, but incur a 1+ to the to hit score when doing so. The US also have the Automatic Rifles rule, which allows for Rifle/Carbine teams to re-roll any to hit rolls during Defensive Fire in the Assault phase, and the don't suffer a 1+ penalty for moving and shooting a ROF 1 weapon. German tanks can use the Shurzen rule, which gives them an additional Shurzen Save of 4+, if and when they're hit in the Side Armor by a Firepower weapon of 5+ or 6. If in Command range, German platoons can also perform a Stormtrooper Move during the assault phase, essentially giving them an additional 4-inches of movement, if they pass a Skill Check. Tiger Tanks also have the chance of gaining additional Tiger Ace skills at the beginning of each turn, which is a set of some really amazingly rules, making an already super lethal tank, even nastier. Real Tigers were mean enough, in this game they're insanely evil. The British are particularly good in assault due to some of their special rules, because they can assault if there isn't a leader present, and they can re-roll failed Motivation tests to Counter Assault, and their tanks suffer no ROF penalty for moving, and then firing. Lastly the Soviets have some crazy special rules, some almost hindering them, like if their Tank and Transport teams move more than 6-inches during the movement phase, they cannot fire during the shooting phase, and when they do shoot, they have the Limited Vision rule, which adds 1+ to the to hit roll, when targets are behind the turrets front line of vision. Although as a benefit to them, it takes 10 successful hits to pin down a Soviet platoon, if they have at last 15 total gun or infantry teams in play. 2nd Edition Hardcover vs Open Fire Rulebook. Pages 4-19 in the hardcover detail the historical background. Pages 209-230 also offer more optional rules covering Fortifications (Trench Lines, Bunkers, Barbed Wire Entanglements, Minefields, Anti-Tank Obstacles, Engineering Equipment, RC Demo Charges, and Fortification Missions), Street Fighting with a mission for it, then Historical Battles and how to create your own. 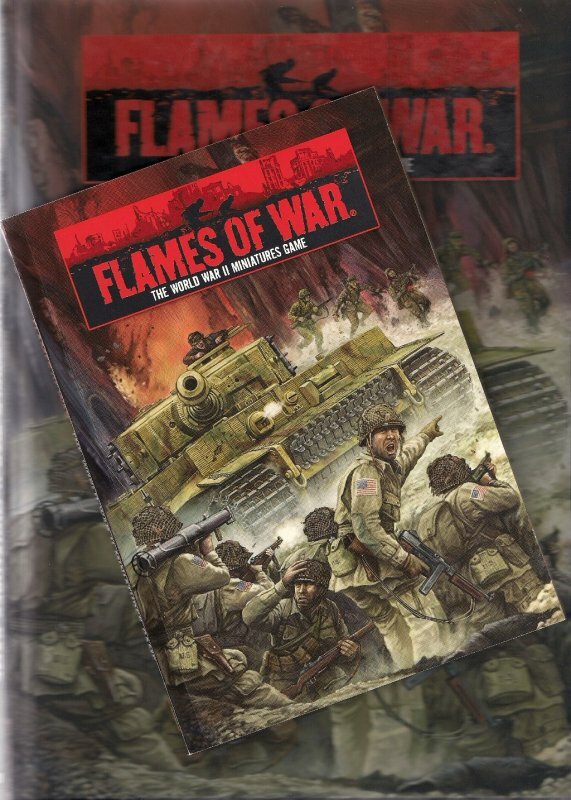 Pages 231-240 include in-depth information on how to create your own Campaigns in Flames of War as well. The rest of the book details how to create terrain, and how to use it in the game, complete with rules for various types of terrain (Desert, Eastern Europe and Western Europe settings), an Example of Play tutorial, the quick reference sheets, and lastly a page of Design Notes. As you can see most of the content that the hardcover has over the Open Fire rulebook is found in the rear of the book, but throughout the book there are also full color photos that don't exist in the Open Fire book, as well as a couple of pages worth of painting tutorials. I wish other companies would take the time to include Quick Start guides this well thought out. Granted you are expected to have read over the rulebook first, but after doing so, this guide fills you in on how to put it all together in play. The quick start guide really does a good job of easing players into FOW. The first lesson is Movement. This scenario depicts the entire play area as a marsh, and is considered Rough terrain. In the middle is a stranded Sherman. Before every turn you have to roll for being Bogged Down or not, and it teaches players about staying in Command Distance too, as both sides try and make it to the middle to the stranded Sherman. The next mission called Shoot-out sets up all of the tanks at predetermined distances, and forces players to shoot it out, without moving, and this goes on until one side is bailed out completely, or dead. Lastly Flank Attack helps to show players how to combine moving and shooting together. The actual final mission called Breakout, is for if you decide to buy a US Rifle Platoon and German Grenadier Platoon to add to the pieces provided. This little guide is actually better than the tutorial that's included in the 2nd Edition Hardcover. 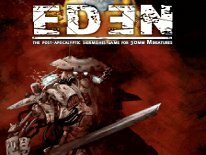 Aside from the Quick Start Missions, the Open Fire Rulebook and 2nd Edition Hardcover both include 7 additional missions to play out. After having went through all that you can with the 3x Shermans and 2x StuGs, via the Quick Start scenarios provided, you'll probably want to expand upon what you have to work with. They do suggest to add some infantry at this point, then to go through the final tutorial mission Breakout!, but most will want more tanks, and/or what ever they fancy most. I've added some infantry, and while they have their place, I'm more determined to add more tanks eventually. I like Flames of War for the tank battles, but it's really so much more than that alone. It's truly a large scale combined arms game, utilizing pretty much all of the WWII weapons and technology available. 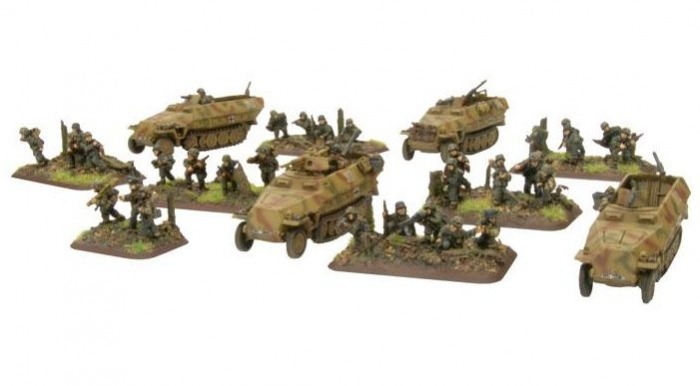 There's literally hundreds of models to choose from, but there are certain limitations to what you can use, during which era, and how, all based on the army lists. A variety of popular wargames games require the use of a rulebook, and then a codex/army book for each specific army or faction, for games where the pieces don't have individual stat cards, or stats that come with them. BattleFront does things similarly, but differently. Before you can move ahead beyond the Open Fire contents, you need to pick an era in which you want to play. All of the army lists which include unit stats and what not, are included in the Intelligence Handbooks, Battle Books, Campaign Books and some can even be downloaded from their website, but the bulk of the lists are to be found in the Intelligence Handbooks. First the era in which you want to play, will limit what units that you can use. The three eras are Early (1939-1941), Mid (1942-1943) and Late (1944-1945) War. Early war hasn't been released yet, but it's set for release soon. They have some big plans for Early War later this summer, so at present it's Mid or Late war to choose from only. You can't just run out and buy the pieces that you think look the coolest, or the ones you want to use most. You have to use many of the pieces alongside, and configured with other pieces as laid out by the Army Lists. Granted there is some variation, and you've given some flexibility at times of what you can use with certain pieces in the lists, but for the most part there's a fairly strict uniformity to the lists, based on historical facts. You can't simply go out and buy all the pieces you like, and expect that they'll all fit together in the same list essentially. Like other popular games, there are organizational charts that dictate the bare minimum troop choices, and after those demands are met, then you can branch off and choose the other supplemental and optional choices. In all of the newer books, the Organization charts are just like those you'd find in GW's Warhammer 40k Codex Forced Organizational Charts, only the Flames of War ones are more detailed, and contain WWII pieces. They also make Campaign and Battle books, which offer a variety of different historical battles and new scenarios to be played out with Flames of War, and are also categorized by era. You could theoretically mix and match some mid and late war units I'm sure, and play them with, and against each other, but then it wouldn't be historically accurate. There's also the fact that a late war army would probably crush a mid-war one, and decimate an early war one, since the tactics and technology improved so much, in such a short period of time. Those scenarios might not be that much fun for the Early/Mid-War player. That's the main reason why you don't want to mix the eras, and it's not supported. Most of the Intelligence Handbooks are roughly $45 discounted online via most popular online retailers. They aren't cheap, but they do cover a lot of ground, offering somewhat of a double duty, since you're getting more than a single army list, but all of the army lists and stats that took part in those eras, and battle zones. Theoretically, if you and a close friend got into Flames of War together, playing the same era, you could get away with only requiring one copy of that book to get by with. There's no single codex to buy for all the US army lists, or all of the German or Soviet army lists. It's all broken down by the era and conflicts. Although I must admit, a single army book design would make this a lot easier, and less confusing for first-time players. However the Intelligence Handbooks may cost more initially, but are filled with many armies worth of data, making them an overall value in the long run. Some of the lists with stats are available as free downloadable .pdfs too through the BattleFront website, but the majority of what you need to play will be in the Intelligence Handbooks. The real question you need to ask yourself is what era will you play? Once you've decided stick with it for a while, because if you want to jump around, buying all of the books required can get costly fast. The Campaign and Battle Books also offer some army lists, but usually only a few. Those books are more designed to introduce the players to historical scenarios to be played out, with a few of the very specialized lists to represent the actual armies that took place in those battles. They're really cool actually, because many of those list armies include some crazy special rules, which help each army to historically play out as they actually did. So what about the miniatures? Most any 15mm/1:100 scale miniatures are going to lack the detail and visual splendor of 25mm-30mm+ pieces. Right off the bat don't expect the same attention to detail, because it's just not there in 15mm. That's not to say they don't look great though. I think the Flames of War stuff is some of the very best looking 15mm WWII pieces out there. The tanks are particularly well done, infantry leave a little to be desired, but again, in a scale this small don't expect to see their eyeballs and extreme facial, or uniform details. Although some of the veteran FOW players can manage to paint infantry well enough, that you can see that kind of detail on these tiny little pieces. Personally, I can't paint a portrait on a grain of rice, so my results leave a lot to be desired, which is why I opted to use stock images from BattleFront for most of this article. I've played the game with a variety of the miniatures from the line, and overall I think I prefer the tanks and vehicles the most. My one major gripe with the Infantry is that figuring out just what pieces, are to be put onto what base together is insanely confusing. At the blister-pack level it's not so bad, but the Infantry Platoon boxes are just too tough to figure out without some better guidance. All of the infantry pieces are tossed together into one compartment. They include no instructions, aside from a nice full color picture on the back of the box to go by of what the platoon looks like built, and professionally painted. Granted some of it wasn't too bad, as I could determine who the Bazooka guys were, and who the half-track drivers were, so getting them separated wasn't tough, but beyond that I was lost at first. Digging around the online catalog for this set was the only way I could begin to put the right models, on the proper bases, because they offer more detailed pictures via their online store. Infantry also are very sloppy in terms of flash and mold lines. If you're used to 25-30mm miniatures, and you jump into Flames of War, be ready for a lot of clean up work when it comes to infantry pieces. Almost every piece required some sort of clean up. I'm talking about time consuming clean up, almost every single piece has nasty mold lines, and flash all over. In such a small scale, it can be time consuming when you are talking about 30+ infantry pieces at once. The tanks weren't nearly that bad, and the vehicles were also reasonable to prepare. From time to time, you might need to cut some extra resin away to make a tread fit, or take care of a mold line, but overall the resin pieces are far better to prepare. Overall the tanks and vehicles are mostly 1-2 pieces of resin, with some metal, or plastic details. For instance the M1A1 Sherman tanks come as a body and turret made from resin, and the barrel is pewter and comes separate. The Open Fire pieces are special though, because if you were to buy a blister pack Sherman, the tracks would be pewter, and you'd have to glue them to the chassis. The Open Fire pieces are designed for the least amount of assembly and preparation. You also don't want to glue the turrets in place, since the direction where the gun is pointing in the game is important. It would however be very easy to use tiny rare earth magnets, to assist in keeping the turrets in place, but movable, and it's something that many FOW enthusiasts do. I didn't have any magnets on-hand, or that's how I'd have modified my Sherman tanks. Thankfully it's something that I can still do later, since I didn't glue them in place. You're also not required to use BattleFront Miniatures models in Flames of War. I believe if you want to take part in the tournament scene, you need to use their models, otherwise it's optional. Therefore you could just as easily use any of the 15mm WWII alternative models out there with their rules, and there are so many companies to choose from in 15mm (1:100) scale. I tend to prefer the Flames of War models, but more recently I've seen quite a few really nice alternatives available in the same price range. So which models you use, is totally up to you, but the I can't see how you could go wrong with the FOW range. I have to hand it to them, they've managed to create a somewhat historically accurate game, and they've done it in such a way that you can buy into it in segments, based on the eras. It's wise for them from a marketing standpoint, since it's more revenue as players outgrow each era and move onto another, but it also gives the player variety, and the means to have something else to do in the game to keep their interest. I say loosely historically accurate too, because the die-hard WWII historical crowd have in the past picked apart FOW for some of it's inaccuracies. Most of the other historical games are far more complex, and offer so much more micro-management, to be so accurate, that those games while more accurate historically, quite frankly, aren't as swift playing and as easy to get into as Flames of War. Flames of War is more of a high production value WWII movie or mini-series like Band of Brothers, versus being a History Channel documentary. It's as historically accurate as it can be, when you have to cram everything into an entertaining, and action packed story that needs to unfold in a few hours max. Like Band of Brothers too, the entire story doesn't unfold in a single sitting. With so many specific battles that took place in WWII, the possibilities for content is vast enough that in almost 10 years of Flames of War, they haven't ran out of content yet. In terms of popularity I'd have to say it's without question the most well known and respected WWII genre wargame on the market today. The only downside at present is that they still haven't produced any Pacific theater content yet. I was informed that it's still part of the long term plan. At present they're banging away at putting the Early War era stuff into the game that players have asked for first. Once that's done, it's looking like maybe 2012 is when the Pacific theater gets the Flames of War treatment. Granted, the European theater content to draw upon is immensely huge, and they haven't showed any signs of slowing down with the recent release of Dogs & Devils as well. I counted 18 books in all, and that didn't include the stand alone rulebook and hobby guides. There's even one supplement called Mid War Monsters, which details the top-secret creations that both Axis and Allied scientists cooked up, including some evil 100-ton tanks. That's on my list of must have books. The Open Fire Starter Set retails for $40 MSRP, and on average it runs about $35 online. 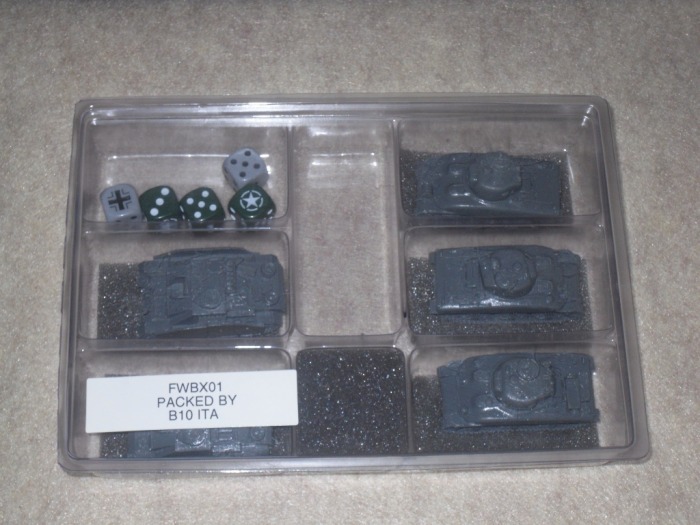 Individual pieces for Flames of War cost about $10 each on average for most of the tanks, and sets with more pieces like Infantry can be $13-$18 per blister pack, and the price goes up from there. They do sell larger boxes with multiple tanks, and infantry pieces, that cost about $50+ each as well. 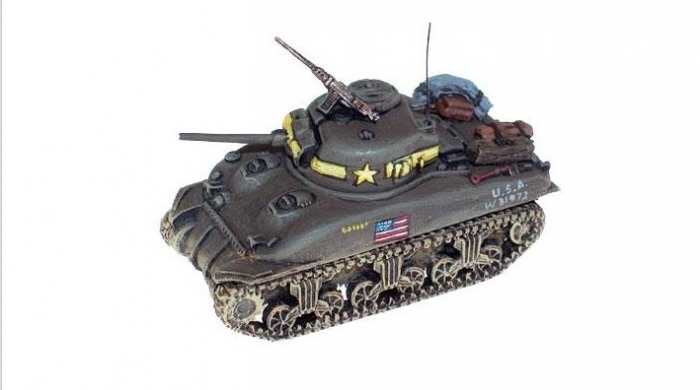 There doesn't seem to be much of a break going for say a Sherman boxed Platoon set of 5 tanks at $45, when they run about $10 each anyway, which is only a $5 break. Nevertheless the infantry and other boxed sets seem to offer the best value in boxed set form. Quite frankly, the Flames of War: Open Fire boxed set is worth the $35 just to get 3 Sherman and 2x StuG miniatures, versus the cost of $10 each, or $50 total for those 5 pieces alone at retail. It would be wise to just buy two Open Fire boxed sets to begin with, so that you can have more miniatures to start with, at a very reasonable price. Both the Sherman and StuG's are very versatile and useful vehicles too. Nothing is to say you couldn't proxy those for later variants of the Sherman as well when playing among friends, or in gaming circles. For a starter set, you really can't ask for much more. In most cases I've seen it for as low as $36 delivered, shipping included. We live in a day and age when most games cost $50-$90 (yes $90 for the 40k starter now!) for a starter, or more for enough pieces and a rulebook to play a new game without a starter. They could have easily put a $50 or $60 price-tag on the Open Fire starter set, but they didn't. 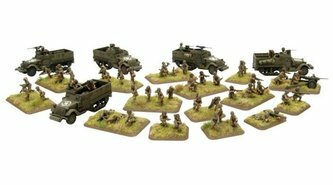 At just $40 or less for Open Fire, Flames of War is by far the most accessible historical WWII game in 15mm scale in the world. It's also the most popular. Flames of War is also printed in 4 different languages, so it's a world wide phenomenon, and they have Open Fire starters for each one. They even have a US online store these days, in addition to the original home-based New Zealand one. Most importantly, Flames of War is a really fun game. 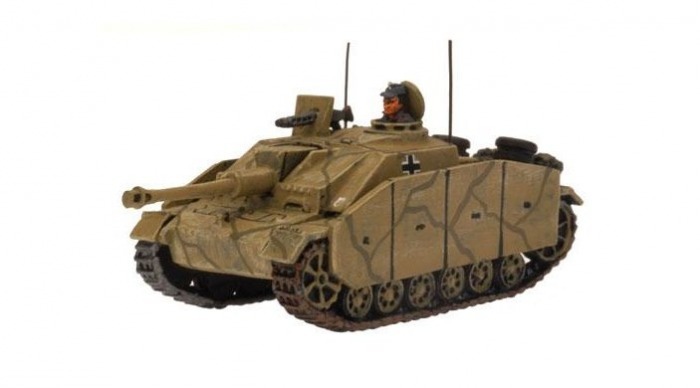 It's not overly complicated, and it can be a simple game of tanks versus tanks, or the ultimate full blown large scale combined arms battlefield game utilizing WWII weapons and technology in 15mm scale. Open Fire is just a glimpse into the world of Flames of War too. It's not just "that 15mm WWII tank game", it's so much more if you want it to be, and with Early War around the corner, the future couldn't be brighter for this game. Once you've decided to commit to Flames of War, I can't stress enough how awesome the hardcover 2nd Edition rulebook is to have. While the Open Fire starter rulebook has all of the essential rules, and makes for a nice tag along book for weekend gaming... the hardcover offers a lot of great hobby info, and more of the historical background, plus more scenarios that aren't included in the Open Fire version. At $45 it's not cheap, but it's also not cheaply made, or cheap in presentation in any way. I'd have to say it's right up there with GW's 40k hardcover, and Privateer Press's hardcover books in terms of durability and quality.